BREAKING: Al-Shabaab claims responsibility for the ongoing attack in Nairobi, Kenya. Announcement was made via an affiliate account. Attack comes exactly three years after the deadly Al-Shabaab attack on Kenya military base in Somalia’s El-Adde town where about 140 Kenya soldiers were killed. 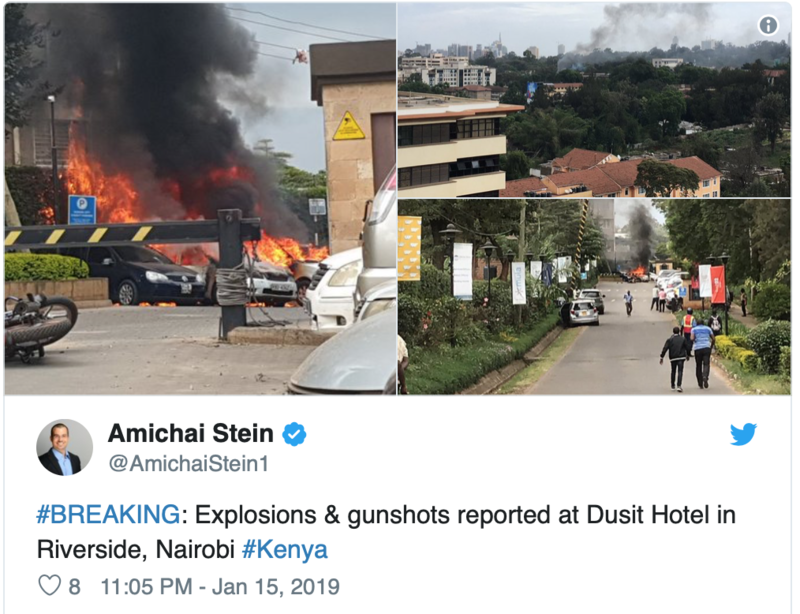 An upscale hotel complex in Kenya‘s capital came under attack on Tuesday, with a blast and heavy gunfire. Witnesses and police at the scene called it the latest terror attack in a country that has seen several deadly ones in recent years. The al-Shabab extremist group based in neighboring Somalia claimed responsibility and said its members were still fighting inside.